What does "Total users online" represent? I'm not sure if this is a bug with Apex or a bug with my hub, but ever since I can remember, even throughout multiple incarnations of the hub (different hardware, software, addresses) the number of total users has always been represented as "n / n+2". It would appear that the n value is correct, but what is that n+2 value? What does it mean? At first, I thought it was the number of online users out of the number of both online and away, but it would appear that the grand total is the first number. Then I thought maybe those extra 2 weren't counted because they were bots (we have two), but again, from the 8-user screenshot, it's clear that the bots are included in the first number. Can anybody provide some insight as to what both of those numbers are supposed to mean? This is caused because of an implementation quirk and is more common on NMDC hubs as far as I know. The reason for this representation, although not intuitive is actually fairly logical. In NMDC every time a user speaks in chat an identity is created for that user the display you are seeing is caused when hub uses an identity that has no representation in the actual user list. This is less common for ADC because it is less common (and less useful because of protocol design) for hubs to speak as a user that is not on the user list, it can be done though. This has happened with both ADC and NMDC, interestingly enough. So is this representation technically "8 identities out of 10 total identities"? Or am I misunderstanding that? If that is the case, what do you suppose those two "missing" identities could be? I'm just curious because there have always been two identities not represented in the actual userlist, regardless of how many users are online or whether the hub is brand new. And is there any way to return a list of the identities to check and see which identities aren't showing up in the userlist? At least ADCH++ and FlexHub seem to have a separate identity for the hub itself (ADC). Those hidden users may also include bots related to script (there's a hidden chat logging bot in ADCH++ by default). There are clients that don't include hidden users in the total user count because of this kind of issues. Awesome, that was just what I was looking for, maksis. We are running ADCH++, so that lines up with what you were saying about the hub and the chat-logging bot being those two hidden identities. However, Crise did say that an identity is created whenever a user speaks in chat. As far as I can tell, the hub speaks when you first connect (welcome message), and if you decide to display the history or do other hub-specific commands like changing the topic or +test. So presumably that is the identity for the hub itself... does the chat-logging bot ever actually speak in the chat? Would there be a separate username associated with that hidden bot? This is getting really specific and nitpicky, so I understand if nobody has an answer or there's not enough information (I can always try to provide more). Just trying to understand to satisfy my curiosity! His comment about creating hidden identities was related to NMDC and it's different with ADC. I'm not totally sure that why the chat history bot has such identity but I'd assume that it makes the hub-side implementation easier (extending/scripting ADCH++ has been implemented in a really awkward way). The assumption should still be that hidden identities are totally invisible to the users so this kind of "issues" shouldn't affect the way how hub-side features are implemented. 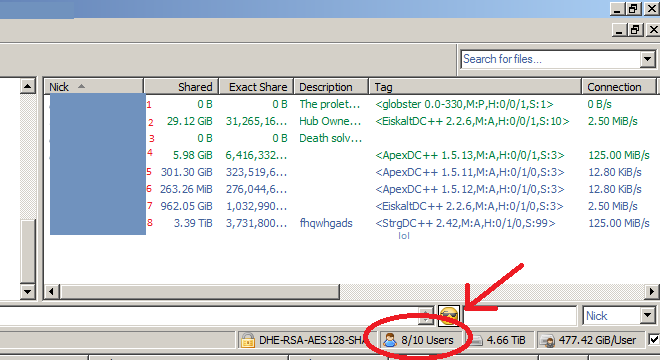 If you try DC++, you'll notice that it will totally ignore hidden users in the total user count.